One of the problems in reviewing this CD is the lack of any liner notes. The CD is a soft-cover ‘triptych’ affair with just a paragraph about each work on one of the ‘panels’. Now, it is possible to look up the internet for details, but I think that the record company ought to provide the basic information to allow the listener to properly assess each work. This is especially true when the music is not particularly well-known. In addition, there is no data about the performers, save their names and a photograph of each. The programme opens with Russian-born Paul Juon’s (1872-1940) Trio Miniaturen which dates from the early years of the last century. I had not heard of the composer, but in places where he is known, he is regarded as being on a continuum between Tchaikovsky and Stravinsky. Based on these miniatures, my jury is well and truly out on that contention. His music covers a wide range of mood. One is not too sure whether he is a romantic composer, interested in presenting folksong, or maybe writing pieces for the salon. For me, there is little here that seems to press on towards modernism. The Four Miniatures began life as piano pieces but some of these were reworked for the present combination of flute, cello and piano. The opening number is entitled ‘Réverie’ and presents a thoughtful mood. This is offset by the sprightly little ‘Humoreske’ which may be based on a folk-tune. Certainly, the middle eight would seem to be a hornpipe with the salty tang of the sea about it. I enjoyed the ‘Elegie’ which is quite lovely in its slow, expressive note of sadness. The work concludes with the ‘Danse phantastique’ which seems to be a mediation of love lost and found at the ball. The entire suite is attractive without being in any way revelatory. I wonder if Paul Juon’s later music does indeed nod towards Stravinsky? Max Bruch is one of Classic FM's ‘one work wonders’ with virtually the only piece played being the ubiquitous Violin Concerto No.1 in G minor. Occasionally, I have heard an outing of his Concerto for two pianos and the Scottish Fantasy. The present Acht Stücke (Eight Pieces) is hardly well-known although I note that there are currently eight recordings listed in the Arkiv website. 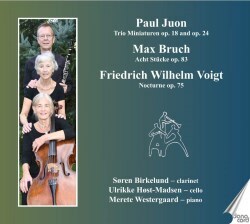 The work was late, written when Bruch was in his 70s. It was composed specifically for his son Max Felix Bruch. The mood of this music is clearly ‘reflective’ but does sometimes exhibit exuberance and power. The music is often intense, spartan in texture but it is nearly always lyrical and well-balanced. The brief liner notes are correct in pointing out that Max Bruch was still pursuing his own musical path, irrespective of what Bartok, Stravinsky or Schoenberg were exploring. There is nothing wrong in that. What Bruch has achieved is a perfect expression of late-romanticism, featuring largely darker colours, but just occasionally exploding into ‘sturm und drang.’ Although the Eight Pieces are played in their entirety here, I understand that selections can be made. However, I feel that it is good to have the complete set. The soloists provide a good account of these three works. The balance between intimacy and enthusiasm is well-maintained. The recording is clear and solid. I was a little disappointed about the short length of this disc. Surely another piece could have been included to take the duration up to seventy-plus minutes rather than just under the hour. I noted the lack of liner notes. I enjoyed this CD. The general mood of all these pieces is typically autumnal, which is maybe how ‘late-romantic’ music should strike the listener. It was just about the end of an era which has (amazingly) managed to linger on into our own generation of composers.